6. 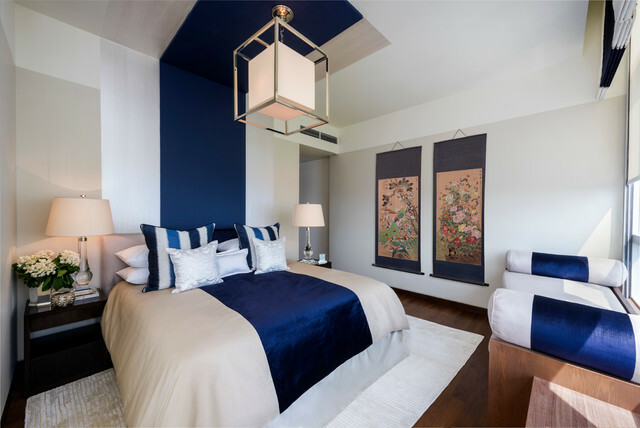 Blue canopyRoyal blue slashes through this off-white bedroom with drama as it extends from the ceiling to the headboard and onto the bedcover. 4. What mood do you want to create in this space?Lighting points provided in an HDB flat or a private apartment are usually adequate for ambient lighting purposes, so all you may need to add is something to change the mood of your space. This means looking at the colour temperature of your lights: a cool white with a colour temperature of about 3,700°C for a living room, a warmer, restful hue of 2,700°C for a bedroom. Meyerise residence by Cameron Woo DesignHow does being a part of a professional association like IDCS benefit your business?At present, I would say that perhaps IDCS has benefitted from having professional ID firms like CWD actively participating in the association more so than the other way around. We would like to encourage more ID firms to participate actively in the association to lift interior design standards in Singapore. Some of the contributions I have been able to provide is securing AkzoNobel as IDCS’ strategic partner, bringing on new sponsors and media partners, rolling out IDCS’ Professional Development Program and working more closely with Design Singapore Council towards accreditation for our industry. Color scheme. Bedding. Light fixture. Lamp.